the data plot is scattered. Such data plots are usually obtained for scientific observations as a result of experiments. quantities. We approximate the relation between two quantities with a line that best fits the data plot. quantities represented by the best fit line will remain the same. This will be clearer from the scatter plot shown below between number of hours of study(x) and score obtained in final exam (y). 90). Since we do not get an accurate line, the equation of the line is only an estimate. the relation between y and x is a positive correlation. independent quantity. The slope of the line representing this correlation is positive. Negative correlation: The value of the dependent quantity decreases with the increase in value of the independent quantity. The slope of the line representing this correlation is negative. Highly negative correlation: A negative correlation with most of the data points lying on the best-fit line. Highly positive correlation: A positive correlation with most of the data points lying on the best-fit line. correlation, there is no correlation between the two quantities. 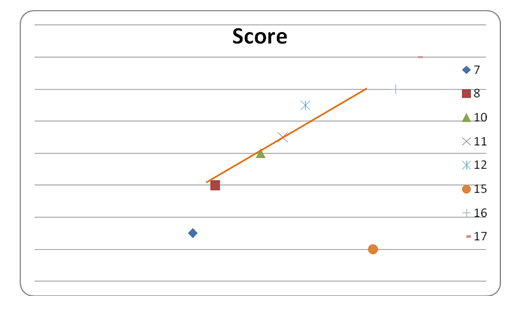 scatter plot depends on the number of observations (x values) taken and also the source of observation. with similar IQ, intelligence and understanding are surveyed. fourth week, 72 the fifth week. At the end of the eighth week, what would have been the best time for Peter?